While the Harvard Business School keeps the #1 spot on the 2014 Full-Time MBA Ranking published by the Financial Times, Yale SOM claims a place in the top 10, and Michigan, Darden and UNC Kenan-Flagler are among a number of US business schools making sharp gains. Top European schools remain stable, while several Canadian, Asian and Australian schools fall back sharply. When Manchester United were looking for a successor for Sir Alex Ferguson, the most decorated manager in English football history, they would have done well to approach the Dean of the Harvard Business School, Nitin Nohria. Under his leadership, Harvard has maintained it’s place at the top of the FT’s full-time MBA ranking – the fifth time it has been #1 since the FT published its first MBA ranking in 1999. Only Wharton has held the #1 position more times in the last 15 years – a total of 10 times (click here to see the FT results of 1999 to 2013). But this year Wharton slipped one place to #4, the position they held in 1999 which had been their lowest historic placing. Climbing above them to #3 is the London Business School, with it’s European rival INSEAD also climbing one place to #5. 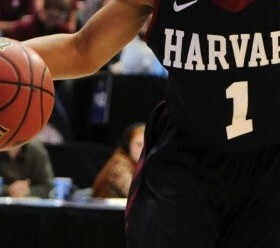 But the single biggest gain among the business schools in the top 10 goes to Yale SOM, which rose four places from #14. It is the first time Yale has made the top 10 since 2007, following a climb of 6 places last year, and will be seen as a vindication of the strategic direction introduced by Dean Ted Snyder with his arrival to the school in 2011. Falling out of the top 10 is the Hong Kong Business school, HKUST, which dropped from #8 to #14. The school was one of a number of Asian business schools whose standing declined in 2014 after several years of steady progress. China’s CEIBS fell two places to #17, India’s IIM Ahmedabad fell four places to #30, and Singapore’s Nanyang Business School fell six places to #38. With over 40% of the FT ranking based on the salaries of graduates three years after finishing their MBA, the fact that so many of the Class of 2010 have doubled their earning power in a difficult global economy is testament to the power of the MBA from a top business school. 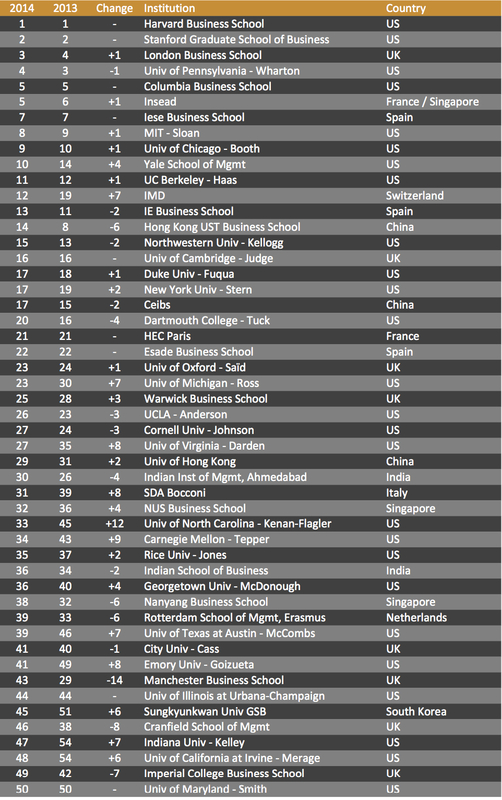 So who are the other winners and losers in the 2014 FT MBA ranking? It was another good year for US business schools, who now hold 7 places among the top 10. Further down, Michigan Ross saw a 7 place jump to #23, followed by Virginia’s Darden School which climbed 8 places to #27. UNC Kenan-Flagler recorded the biggest gain among the top 50 schools, gaining 12 places to #33. Carnegie Mellon’s Tepper, UT Austin McCombs and Emory’s Goizueta also had a good year, climbing by 7 or more places. The top US schools that struggled include Dartmouth’s Tuck, which lost 4 places to #20, while Northwestern’s Kellogg, UCLA Anderson and Cornell’s Johnson School all fell slightly. A champagne moment should be noted for University of Washington and Boston University, who both registered the highest climb in this year’s results, climbing 20 places to #58 and #75 respectively. European business schools in the top 25 had a solid year. IMD has the most to celebrate with a 7 place jump to #12, while IESE, Cambridge’s Judge, HEC Paris and Esade all remain unchanged. Further down the table, Italy’s SDA Bocconi continued it’s progress from last year, rising another 8 places to #31, and the Lisbon MBA which entered the FT MBA ranking only a year ago put in another impressive performance, climbing 9 places to #52. And Germany can now claim another business school among the FT’s top 100, with ESMT entering the ranking for the first time at #89. Among the losers, the Rotterdam School of Management continued its slide, losing 6 places to #39, while the Vlerick Business School props up this year’s table with a #16 place fall to #100. But it is UC Dublin that has the dubious distinction of seeing the biggest fall this year, tumbling 27 places to #91. In addition to LBS, the UK’s Oxford Saïd and Warwick Business School both saw small gains to #23 and #25 respectively. This was in sharp contrast with the Manchester Business School, which recorded the single biggest drop in the top 50, losing 14 places to #43. Other UK schools also suffered, with Cranfield dropping 8 places to #46, and Imperial College losing 7 places to #49. Things were no better in Australia, with AGSM losing their place in the top 50 with a fall of 14 places to #62, and the Melbourne Business School also sliding 6 places down to #68. And while many of the top performing Asian schools of recent years all lost ground, there were a few bright spots including NUS Singapore gaining 4 places to #32, and South Korea boasting a business school in the top 50 for the first time, with Sungkyunkwan climbing 6 places to #51. The IIM Bangalore and Shanghai Jiao Tong also have special cause to celebrate, as they make the FT’s top 100 for the first time, at #68 and #77 respectively. Below are the 2014 results for the top 50 business schools. Click here to see the results of the big five MBA rankings of the last 12 months to produce the MBA50.com Premiership.